Just a short post this month. 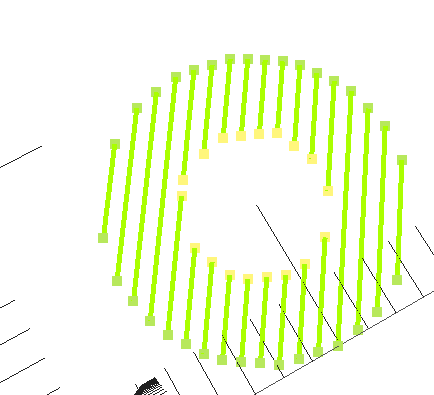 I just wanted to give an example of dynamic arrays which are available in RapCAD version 0.4.0. The screenshot shows what I came up with. Not very exciting, but hoping that this will help William Adams to realise some ideas that he has had regarding this. The thing that makes dynamic arrays work is the concatenation operator ~ and the append operator ~=. The operators were influenced by thier counterparts in the d programming language. On another note I have been talking again with Marius who has been looking at the RapCAD back-end code, he seems quite interested in collaborating on a shared back-end library. At this stage he is working to get his visitor branch into OpenSCAD master. 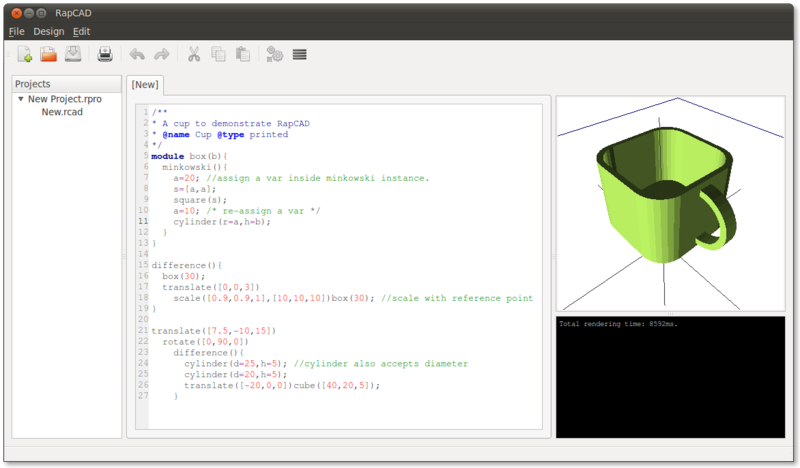 When this is done and stable we would like to put some of RapCAD’s features such as this one into OpenSCAD. 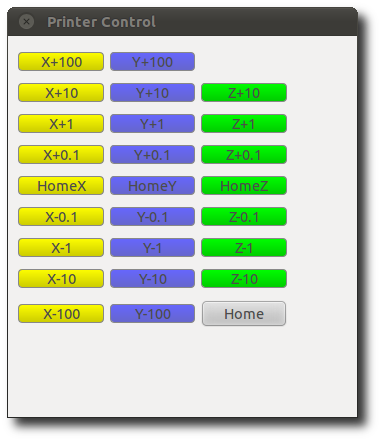 Version 0.4.0 is available this month and supports Dynamic Arrays. See the Download Page for details. Posted on September 8, 2011 February 10, 2013 Categories RapCAD5 Comments on RapCAD dynamic arrays. The syntax for importing modules into rapcad is quite different from the legacy way of doing it. I decided to break compatibility because of a number of problems with the old syntax, that arise when you want to quickly scan for dependencies. Lets first consider a valid example using the old syntax. The first problem with this is that the filename argument is actually an expression. If you were parsing this script to find its dependencies, the parser would have to be able to partially evaluate the script, turning str("file","name",".stl") into the string literal filename.stl. The second problem is that the import statements are nested in several sub constructs, meaning that the parser has to understand these constructs in order to extract the import module statements. Last of all the legacy way of importing seems to be inconsistent with the way ‘use‘ and ‘include‘ statements work. The import statement appears at the top of the file and it doesn’t take an expression, only a string literal. It cannot be nested, and it fits with the use and include statements. The statement is followed by an ‘as‘ clause and the identifier following the ‘as‘ clause provides a name which can be used to instantiate the imported module. The module can be instantiated any number of times, just as you would any other built-in or user defined module. The module instances can of course be nested in any other construct as required, but the import declaration remains at the top of the file, and so one can easily glean which files the script depends on. Version 0.3.0 is available this month and is capable of importing OFF files. See the Download Page for details. Posted on July 8, 2011 June 7, 2013 Categories RapCADLeave a comment on How RapCAD will do CAM. Posted on May 8, 2011 January 29, 2013 Categories RapCAD3 Comments on RapCAD is Rendering! I have been trying to understand and document the windows build process for OpenSCAD so that Marius and Clifford might soon be able to publish a new release. While doing this Marius and I got talking. 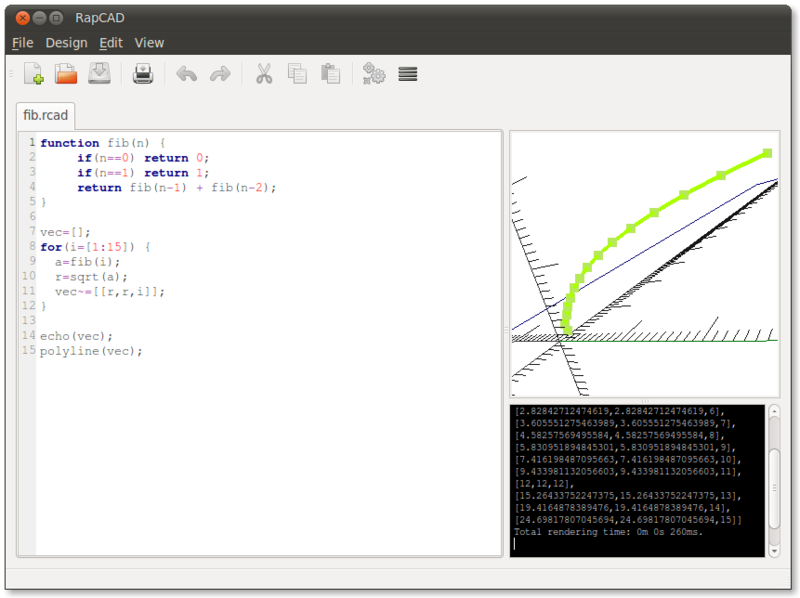 Specifically he wanted to know whether the work I had done for RapCAD on variables would work in the OpenSCAD back end. I told him a bit about the parser I had implemented, and how I thought that a strong concept of Statements within the language syntax would be needed to support this. 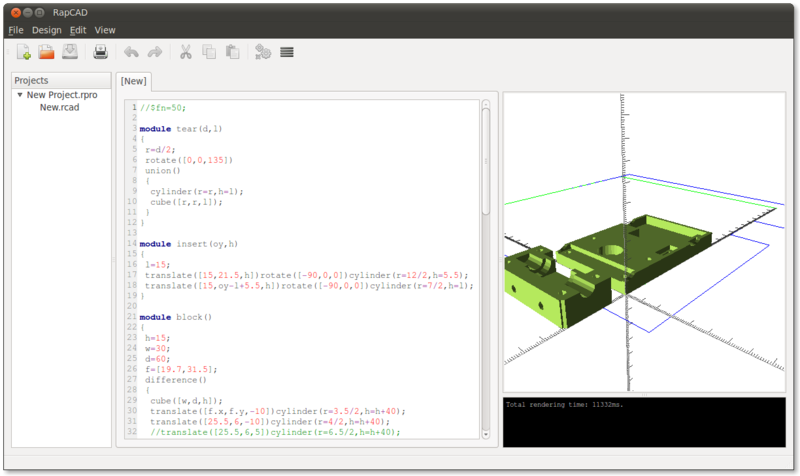 We agreed that (like many projects) the OpenSCAD language has evolved over time, and its evolution had led the design to a more Declarative syntax rather than a Procedural one. I can understand things much easier if its my own work. Its easier to do research in a new project, than try and modify some existing codebase. l like to think of RapCAD as my own research experiment, into an ‘Openscad 2.0’ language spec, and other potential re-factorings that might someday be applied. Marius added that in many ways that was what Clifford had done, when he took MetaCAD, and re-wrote it in C over a summer holiday. 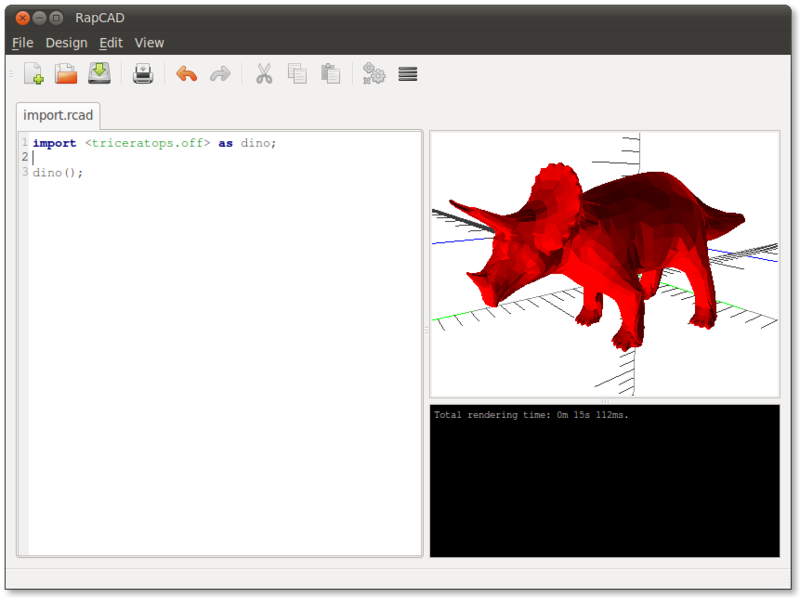 Another thing we talked about is the possibility that some day OpenSCAD might drop CGAL as its back end rendering subsystem, and perhaps adopt something like OpenCASCADE. 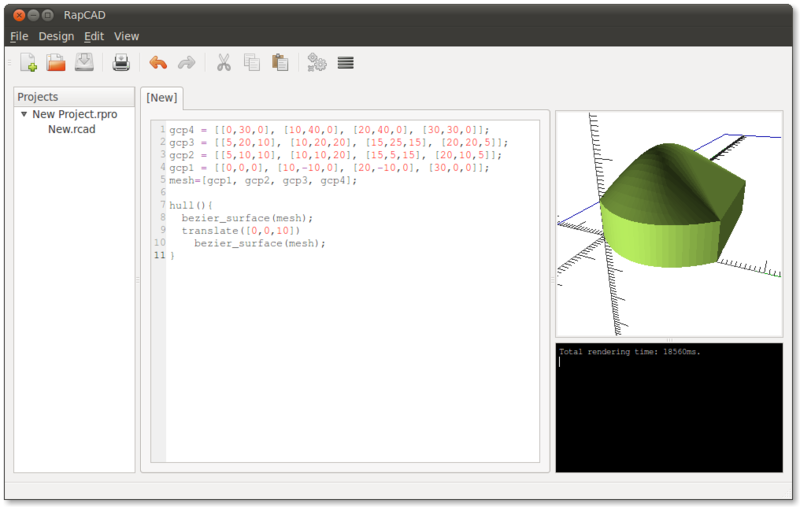 It makes sense to try and integrate RapCAD’s scripting engine with the OpenSCAD rendering engine in much the same way as efforts like pySCAD have done. One idea that Marius presented to me was that of a low level API that projects like pySCAD and RapCAD could use. The API might be text based vastly simplified to a description/modeling language that only supports the basic primitives such as polyhedrons, which all other shapes can be defined in terms of, as well as csg operation nodes, and transformations which can all be defined in terms of multmatrix. In summary I am focusing my efforts on connecting up my existing code to just the rendering functions of OpenSCAD, and modifying OpenSCAD so that it has a generic API for projects like pySCAD, SolidPython and CloudSCAD can use as well.